Bergamot Station: Dark Mood in a Sunny Place. I am temporarily (as usual) working in a new neighborhood of LA. This time, it’s near Olympic and 26th in east Santa Monica. 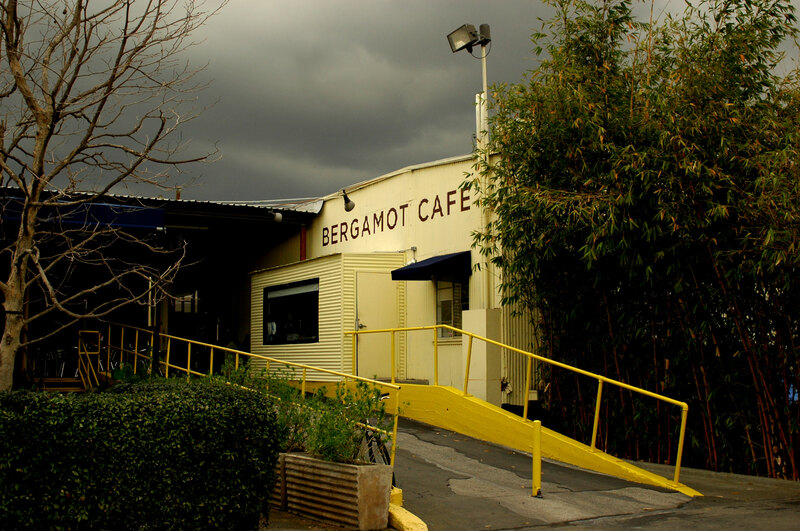 I went out to lunch at Bergamot Station, that corrugated steel collection of art galleries and exhibition spaces built on land that probably was once industrial. As always, the weather is glorious around here. You step outside into windy sunshine, with jasmine and ocean scented breezes. Young workers out for lunch, in their untucked shirts and droopy jeans, fall into Bergamot. They have a cafe there, at the very end of the little street, serving healthy stuff like avocado and turkey on multi grain bread with lentil or pea soup on the side and a vinaigrette dressing on the dainty greens. Apple juice comes with our without bubbles, green tea is iced or hot, and I suppose that even the grape sodas come from free range grapes. I saw some framed black and white photos, and a handsome, lean, Brilliantine Latino UPS driver delivering boxes, and a fat man in a convertible Mercedes, along my walk. Then I spotted something from a long time ago that once hung near the Dan Ryan Expressway in Chicago: A giant neon sign of red lips that read, “Magikist”. Chicago was once full of such signs, the vulgarity of the Windy City in the mid-20th Century, now seen as some magical epoch of innocent pride and civic culture. As a boy, I would ride in the back of my parent’s 1966 Blue Pontiac Catalina Coupe,taking it all in. My mind absorbed all signs in those days, unlike today when I cannot even remember what street is one block north of mine in Van Nuys. These are dark days for me. I have no plans for the future. Only a vague sense that I have to survive because other people want me to. In the sunny breezes of Bergamot, I saw interpretations and creations of art that made me want to rethink how I think and feel. I’m very familiar with the feelings described in this post. Andy, I’ve been a fan of hereinvannuys for quite some time. I’ve also been checking out your photos on flickr. Your talent, intellect, sensitivity and humanity have touched me deeply. You have a voice. You make a difference. Be well. The sense of nostalgia was overwhelming while I read your post. I could taste the green tea and almost smell the ocean air. It was very poetic, personal, and yes, a little sad, but very nice. ← More Good News From the Bush Era.